Come in to see many more in-house bargains. sunlight. It loves a humid atmosphere. This natural fertilizer releases its nutrients slowly as it breaks down. Made from all-natural ingredients with no sludge, fillers, or chemicals. Encourages strong, steady growth and big, beautiful blooms. those small spaces in the garden where you'd like something showy. Self-straightening technology keeps kinks and tangles under control. Microshield anti-microbial protection against mold and mildew. surrounded by larger, silvery-white disks against pale blue-green leaves. decorative rocks into the tray, add water, and place your plant pot on top. As the water evaporates, the humidity around the plant will increase. 8", 10", 12" sizes available. Maintain hanging baskets easily using these round coco fiber liners. helps keep your soil in place and retains moisture for healthy plant roots. ensures they can withstand the elements outdoors. all the beauty of the real thing. Use in a fairy garden or a succulent garden. Fertilizer with a special pH level just for acid-loving plants! Blended with premium organic ingredients like cottonseed meal, bat guano, kelp meal, and humic acid. Beneficial microbes to help convert fertilizers into vital plant food. Provides gentle, slow-release feeding all season long. Super concentrated, non-selective weed and grass killer. Contains a double surfactant formulation that dries on plants fast to start working quickly down to the root. Use near fences, on paths, patios, sidewalks, and curbs. Rainfast in 2 hours. swimming happily in a fruity-fragranced, naturally moisturizing glycerin soap. It's mild, kid-safe, and ready to liven up your clean routine! and vanilla. Uses only real cane sugar and natural fruit juices as sweeteners. Cheery houseplant, bright-eyed flower faces ringed by rich, velvety leaves. fragrance & taste. This is a lovely perennial for borders, or patio containers. Tiny rose-pink flowers appear in summer. and sphagnum peat moss give this soil its light, aerated texture. Start with Ocean Forest and watch your plants come alive. Use as mulch around your vegetable plants. Straw helps to hold in moisture, so you don't have to water as often. and it composts naturally into nutrients and amendments for the soil. and add nutrients to the soil for optimal plant health. transform into bright red edible fruits. Lil' Kim shrub sports elegant white flowers with a showy red eye. To master the sport of cooking outdoors, natural hardwood is a game changer. maple, cherry, pecan, apple, and oak pellets. by feathery blooms that gently wave in even the slightest bit of wind. take on a pinkish hue early in the season and then fade to a golden tan. and abundance of star-shaped white blooms, looks like a snowdrift! Spreads quickly and even cascades over walls. Freesias combine a delightful perfume with delicate beauty and showstopping color. South Africa, freesias are very easy to grow and tolerant of a variety of soil types. Use them as long-lasting cut flowers as well. and with just a touch of spicy heat. Its large 3" bulbs produce many cloves. A wonderful garlic for all-purpose use where mild flavors are preferred. Lily of the valley is one of the most popular flowers each spring! Very fragrant, the plants are ideal for use as ground cover in shady areas around the tree line. They will require one season to get fully established. while still letting air and water through the fabric. to protect against the toughest perennial weeds. 6 ft. wide. Reg. $.99/linear ft.
Nostalgic for you, and fun for your pet! Says, "Ohhhhh Noooo" when squeezed! Plush filled. Great for fetch and play. Suitable for dogs of all sizes. to 20 ounces of bird seed. A great item for bird lovers! Echter’s Rewards is our program designed to reward our loyal customers. Membership is free and there is no annual membership fee. and give us your daytime phone number and we can look you up that way. available to Echter’s Rewards members. Echter's Rewards members receive Greenbucks with their purchases starting March 1 that they can redeem just like cash for up to half their total purchase for 2 weeks in July. (July 1-18 in 2019). 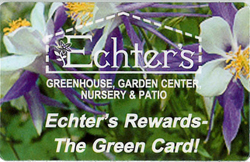 Echter's Rewards members also receive Greenbucks with their purchases starting October 1 that they can redeem at the end of December for up to half their total purchase (December 14-31 in 2018). Active members receive advance notice of events, classes, and special sales. Active members receive 4 Echter’s newsletters mailed each year with exclusive discount coupons inside. Rebate Certificates of 1% of your total purchases will be mailed out in February, if total purchases with a card are over $500 in calendar year. The certificates can be spent like cash at Echter's. Lost Key Return Program should you lose your keys. All information involving the use of this program will be kept confidential and used exclusively to provide you with special values. This is not a credit card. This card remains the property of Echter’s Greenhouses, Inc., and we reserve the right to modify or rescind the program at any time. Questions? Call us at 303-424-7979.